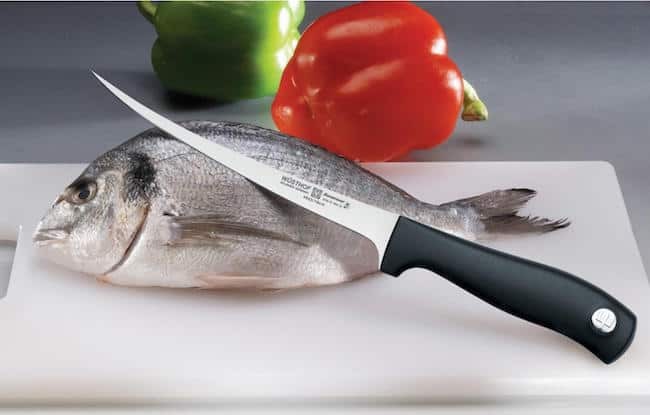 Whether your a fisherman, a fish monger or a cook that enjoys preparing fish for the plate, the fillet knife will be one of your most important tools. 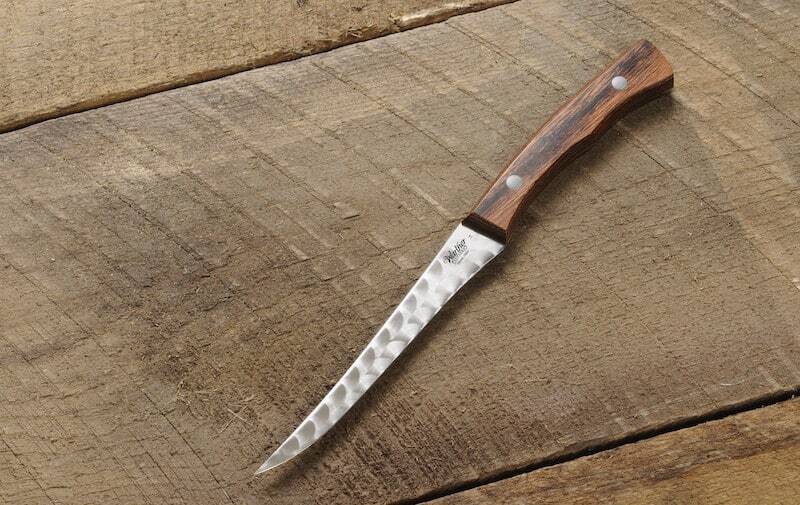 (Head here to see our number one fillet knife for 2016). With this being the case, you should ensure that your fillet knife is always very sharp to help you cut your fish in a manner that is both safe and effective. 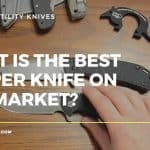 In this article we will show you how to keep your knife in top shape. 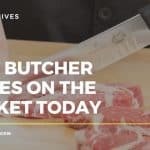 We will look at the best ways to sharpen your fillet knife and the tools you should use, and other general maintenance tips to keep everything working as it should. Depending on where you are, will often determine the type of tool you use to sharpen your knife. A fisherman may need to quickly hone his knife while out at sea for example; plugging in an electric sharpener would be rather impractical. A sharpening steel would be a much better option. Conversely, the home cook may have the sharpener ready on the worktop, a few passes through the sharpening stage will restore that dull edge with ease. The following methods are 4 effective ways you can sharpen your fillet knife. 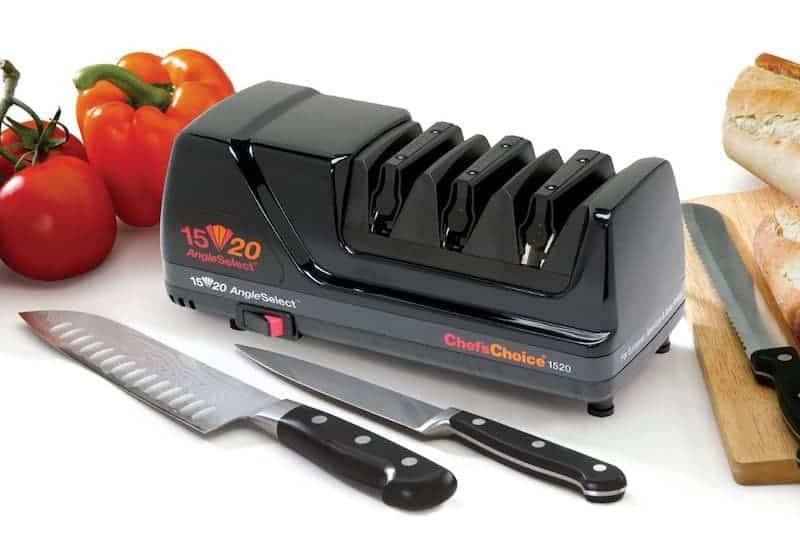 By far the simplest way to sharpen a knife (fillet knives included), is to use an electric sharpener. 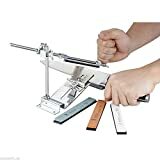 The majority of sharpeners will have at least 2 stages, one for sharpening (and actually removing steel from the blade edge), the other for carefully honing. What ever model electric sharpener you own (or intend to buy) the principles are the same. 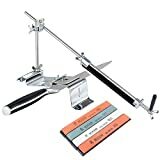 You will need to pull the knife edge through the sharpening stage (which is usually a thin slot on the top of the sharpener), for the number of passes it takes to reach the required sharpness. The honing stage is used for just that, bringing back the edge on a knife before it becomes dull. As a preventative measure, it is best to get in the habit of use the honing stage after extended use of your fillet knife. This way, it will be ready next time you pull it from the block. Here at Sharpen Up we have reviewed a number of electric sharpeners over the last few years. 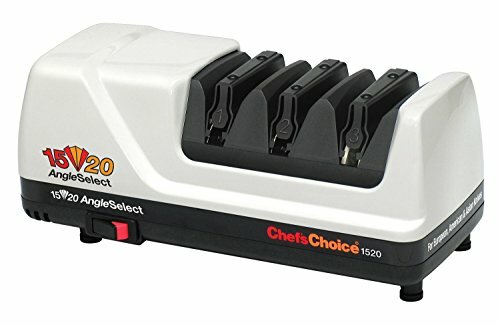 One sharpener that has stood out from the crowd, striking an excellent balance between performance with affordability is the Chef’s Choice Model 1520 AngleSelect Diamond Hone Knife Sharpener. 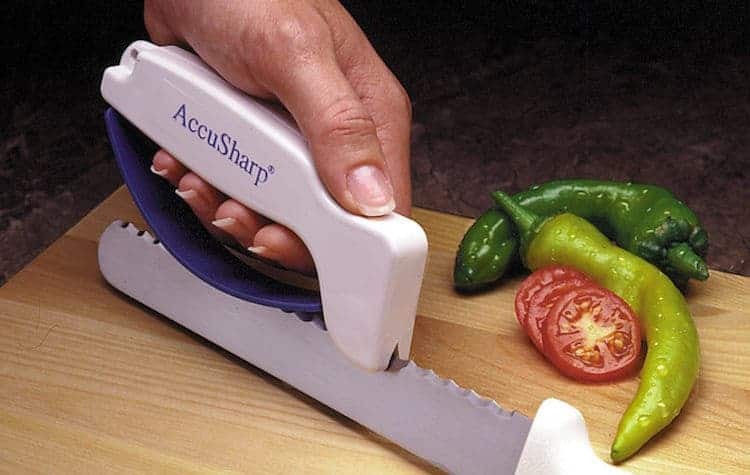 This extremely versatile sharpener is able to restore and recreate both a 15 degree angle (for Asian style knives) as well as a 20 degree angle on for European and American style knives. The system also features 100% diamond abrasives and patented flexible stropping/polishing discs all of which helps produce an edge of incredible sharpness and durability. In fact, the list is long on what this superior electric sharpener can do. For purists, the whetstone is the only way to sharpen your tools. The level of control that you have pursuing this manual method is far greater than running your knife through an electric sharpener. 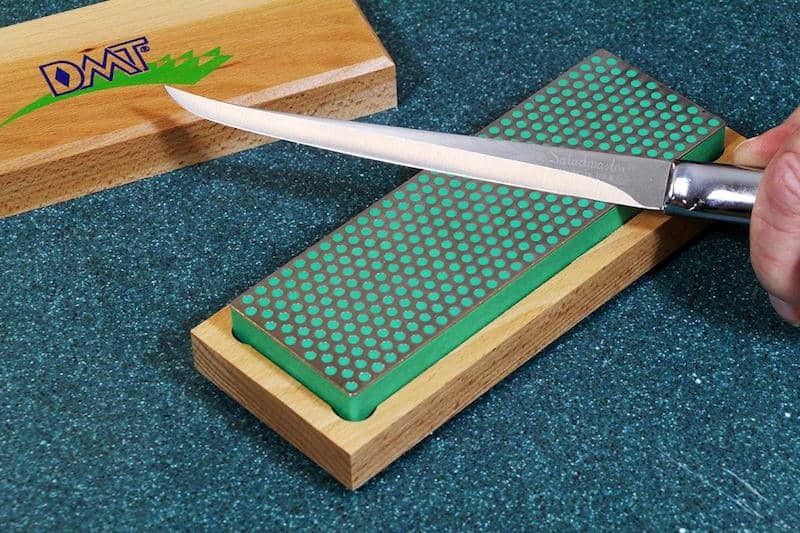 If you have spent good money on buying your knives in the first place, buying a whetstone or diamond stone and learning this age-old method of sharpening is definitely recommended. However, there is a caveat; you should practice using cheaper knives first. Sharpening the wrong way using a stone can ruin your edge. 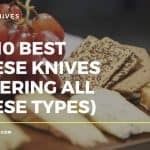 Furthermore, fillet knives have very thin knife blades, while this can result in extra sharp edges, there is also the need for greater care when sharpening your tool. While using the stone, the essential part of this process to ensure that you achieve the desired results lies in the angle and technique used to sharpen the knife. This is done by sliding the cutting edge of fillet knife over the sharpening stone, in a manner similar to slicing butter. The back end of the knife will have to be positioned slightly above the sharpening stone in order to easily slide the knife forward and also to make the knife very sharp. Optionally, you can use a coin in order to position your knife at the right angle, and position your fingers above the knife to safely slide the knife over the stone without cutting yourself. This process is done easily on each side of the knife until the fillet knife is sharp as required. In a recent article we covered some of the best diamond sharpening stones on the market in 2016. (You can read that here). Our findings named the DMT WM8EF-WB 8-Inch DuoSharp Plus Bench Stone as a number 1 choice this year. 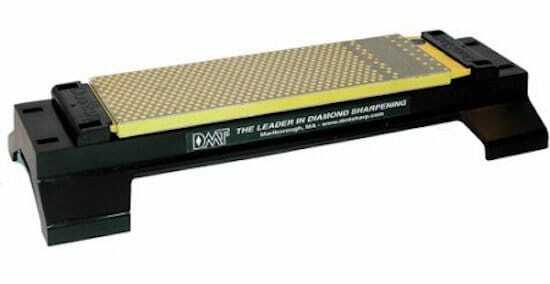 The beauty of a diamond sharpening stone is that there is no need for messy oils or water. Performance is top notch on the DMT and is well worth a look. 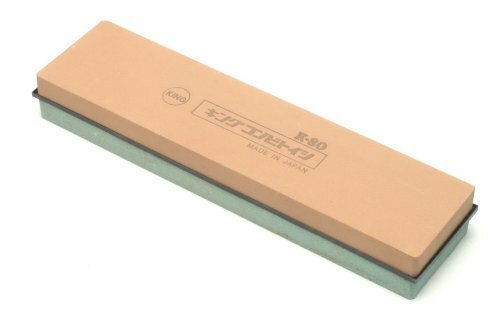 Should a whetstone sharpener be your thing, we recommend the Kotobuki King 250+1000/K-80 Combo. This is an excellent, low-priced water stone with a versatile double-sided grit to suit your fillet knife sharpening needs. A little earlier we described the scenario of a fisherman needing to sharpen his fillet knife while out on his boat. Both the electric and whetstone method would be highly impractical in such circumstances. 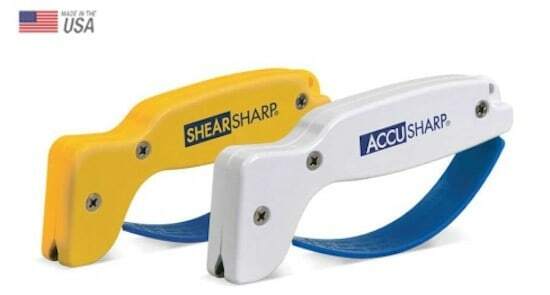 For quick and easy sharpening while on the fly, a tool such as the Accusharp is a fantastic way of getting back an edge where and when you need it. Using this tool to sharpen your fillet knife is very simple indeed. You just place your knife on a flat workspace, with the cutting side facing upwards. You then have to place the “v” shaped part of your accusharp tool on the knife and start sliding the tool over the blade. Repeat the same process to ensure that your knife reaches the sharpness required. After sharpening your fillet knife, you can use a round metal steel to hone the edge of your knife by sliding the knife over the steel. 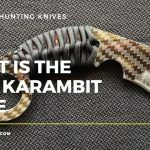 This is done at the same angle as the one used with a sharpening stone and you may also find it necessary to slide the knife in the direction away from you unless you are a real expert in doing this. You can also find a filling tool on the market that has threads that allow you to sharpen your knife over it if blunt. This tool is also most appropriate if your knife needs just a quick touch up after cutting several fillets.